Images of Björk from a SubSpace presentation at the Charles Hayden Planetarium. I am in a tunnel of blue light that is also sort of a hurricane. I am approaching its mouth, or its eye. Fish spiral toward me. “I thrive best hermit style, with a beard and a pipe and a parrot on each side,” Björk croons, in the background. Then I am in a watery place where silver orbs are bouncing. Actually, I am in the Charles Hayden Planetarium at the Museum of Science. This show is part of their SubSpace Project, which features dynamic visual interpretations of music. Harnessing the planetarium’s immersive dome-theater space and highly advanced audiovisual technology — usually used for shows like “Moons: Worlds of Mystery” — the staff is now paying tribute to musicians. In this case, it’s Björk, the avant-garde Icelandic singer who has inspired a cult following and even a mid-career survey at New York’s Museum of Modern Art. David Bowie tribute. The idea came from Dani LeBlanc, producer at the planetarium, in the wake of Bowie’s death in January. Moved by his passing, she started listening to a mix CD of his music that she keeps in the planetarium. She was looking up at projected stars. When “Space Oddity” came on, she thought that maybe other people would want to do this, too. She pitched the idea of a Bowie tribute in a meeting, and was surprised by how much interest people had. 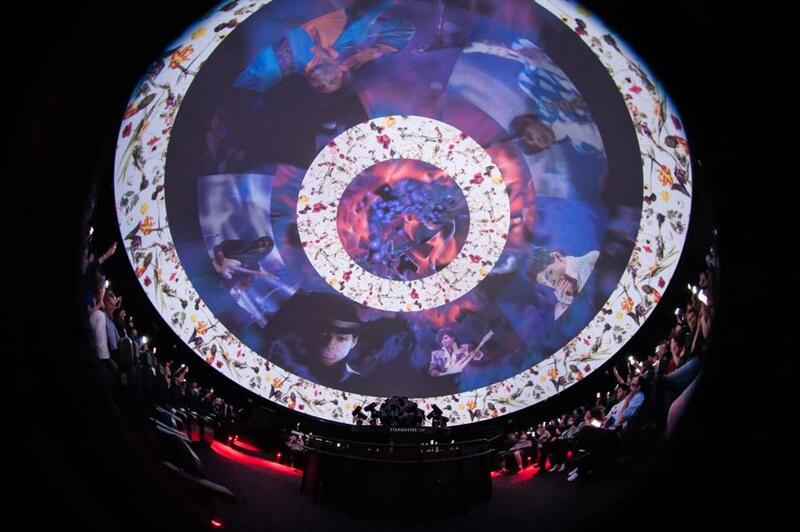 Planetarium animators and media producers worked to create a visual show to accompany Bowie’s music and launch a tribute series that included six shows. “Boston got a lot of Bowie,” LeBlanc said. And Boston liked it: All of the shows sold out. So the idea of a monthly series was born, and became SubSpace. Planetarium staff considered other musicians they could honor and interpret. They announced their summer lineup: Prince, Bjork, and Beyoncé. The plan was to do one show dedicated to each artist, but they’ve added a second Beyoncé show, due to popular demand. Prince and the Purple Rain album show played the Hayden Planetarium in June. In a bizarre coincidence, Prince died the day of this announcement. LeBlanc said they changed the tone of that show a little bit, and it became another tribute to a musician’s life as well as his music. The Museum of Science might seem like an odd place to go for a music show, but Wetzel said that their adult programming has gone in many nonscientific directions. This past winter and spring they hosted a storytelling event and two gaming events. They’ve even had live music several times, featuring local artist Ian Ethan Case. They’re undeniably popular. In Boston, there were at least two in June, one at the museum. “They still fill up,” Wetzel said. Planetarium staff are quick to point out the differences between the SubSpace shows and Laser Floyd. For one, the laser shows are pre-packaged and purchased from a company that produces them, while the SubSpace visuals are original creations. For another, SubSpace shows use much more than laser technology — even 3-D animation. But, LeBlanc said, Laser Floyd isn’t going anywhere, and the shows are capitalizing on what keeps this trend alive: People like to watch and listen at the same time. “We want to make use of what made laser shows so accessible in the ’70s and ’80s, but we want to modernize it and bring it into the 21st century,” LeBlanc said. In the Bjork show, the visuals were high-tech, sometimes so 3-D that I got dizzy. Sometimes there was real-time interaction with the music — vibrating sound waves, for instance — but often the visuals moved fluidly through spaces animators had imagined. 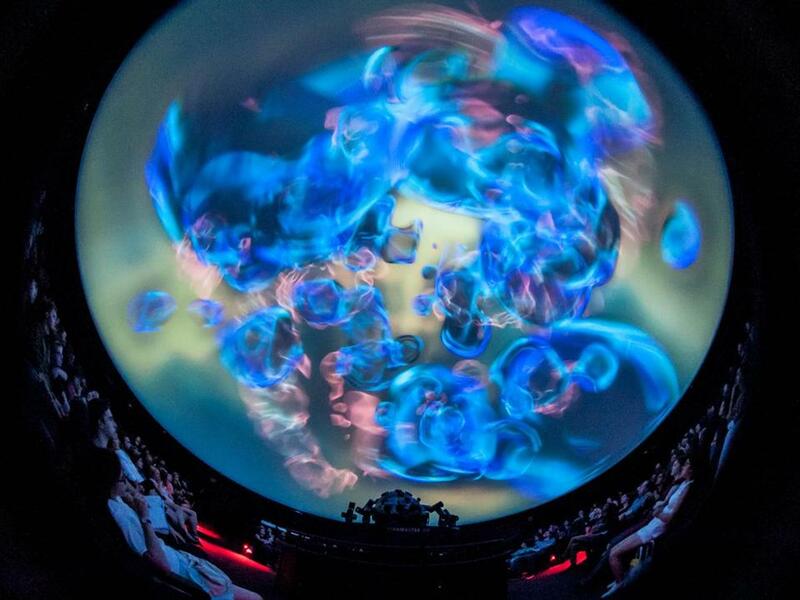 “Her music really allowed me to enter into a concept space,” said Charles Wilcox, a planetarium animator. “It allowed us to explore interior spaces and exterior spaces, like the two forests.” Wilcox said he worked on two songs: “Sun in My Mouth” and “It’s Not Up to You,” and the visuals took him about a month. 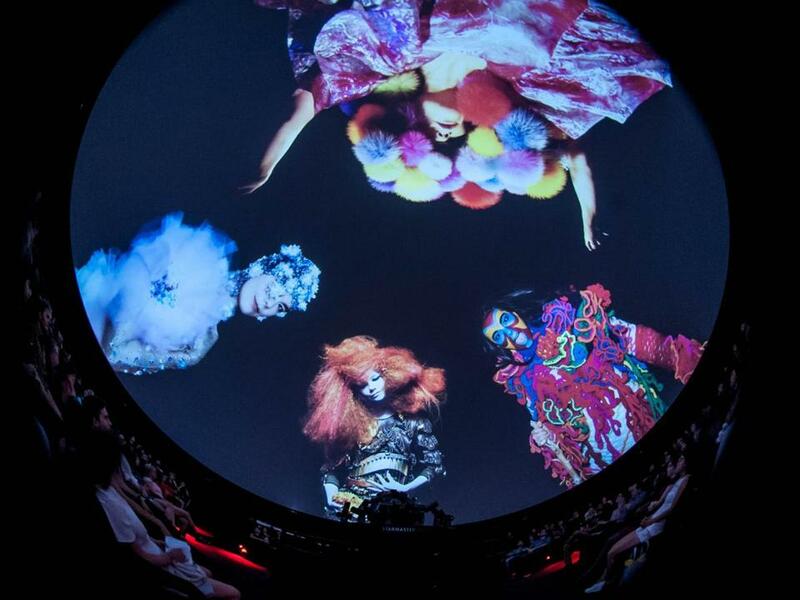 The show opened with a clip of Björk speaking about the intersection of nature and technology. “You can’t just be only techno,” Björk said, “and you can’t be only nature; you have to be right in the middle. It’s very important.” The visuals moved between recognizable natural landscapes — a forest, a desert-like space at sunrise, an ocean full of fish — and more urban spaces, like a city at night. Sometimes the spaces were simply abstract, whirling colors. Bjork’s music is interpreted visually by the Charles Hayden Planetarium staff in a SubSpace tribute. Some of the shows are more narrative than others, LeBlanc said. The Bowie show charted a journey to space and back, drawing more from the planetarium’s regular image library and pairing it with his often space-themed music. For Prince, they stuck to the narrative he created with his album “Purple Rain.” For Björk, the show didn’t tell a story, per se, but dragged viewers into a space of music and sound. For shows to come? “I’m guessing Beyoncé will have a bit of a story,” LeBlanc said. “We’re not going to re-create the ‘Lemonade’ album but we’re paying tribute to a woman as she’s reaching new depths of her career.” The Beyoncé show will be on Aug. 24, at 7:30 p.m. and 9 p.m. There will be more shows in the fall, because every show has sold out so far. Before the Björk show, Wetzel announced the fall lineup: Radiohead, Sept. 21; Tom Waits, Oct. 12; Lady Gaga, Nov. 9. The Lady Gaga show will be a massive celebration called the “Monsters Ball” that will spill out into the main museum lobby, featuring a cash bar, DJ, and costumes. Tickets will go live Aug. 9. “We’re pushing the boundaries of what people expect when they come to the Museum of Science,” Wetzel said. Sophie Haigney can be reached at sophie.haigney@globe.com . Follow her on Twitter at @SophieHaigney.